Yesterday Phil and I took Finn and Sputnik for a hike up the Bartlett Trail in hopes of reaching the top of Greenhorn Mountain’s south peak. We got a late start and didn’t make our goal, but we still had a very nice time. The boys took turns carrying the 20 lb. pack. Each one carried it halfway up, and each one carried it halfway down. There were a lot of logs over the trail so there were many opportunities for them to learn how to negotiate obstacles with a pack on. Jump over? Crawl under? Go round? It was fun to watch their brains working to figure out the best route. 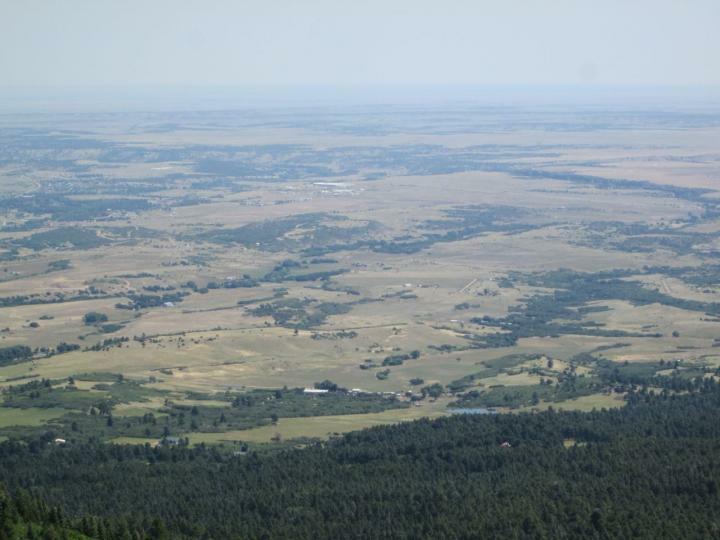 This trail has amazing views of the eastern plains and of Rye and Colorado City spread out below us, including our own house. 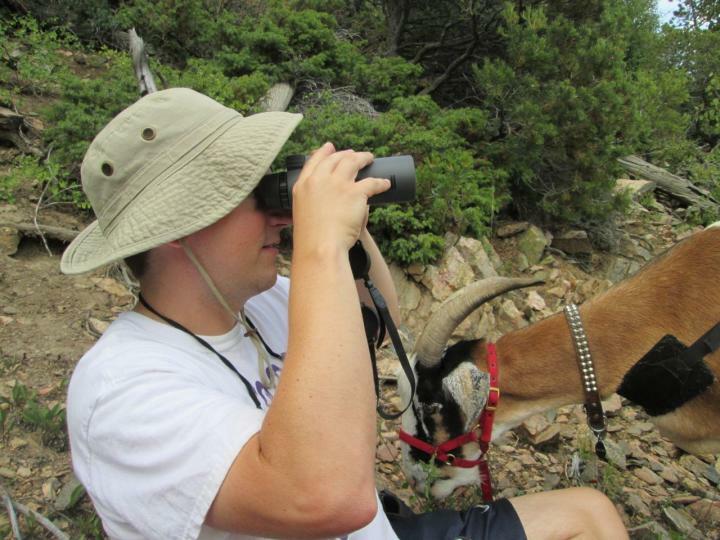 Phil was clever enough to remember the binoculars. 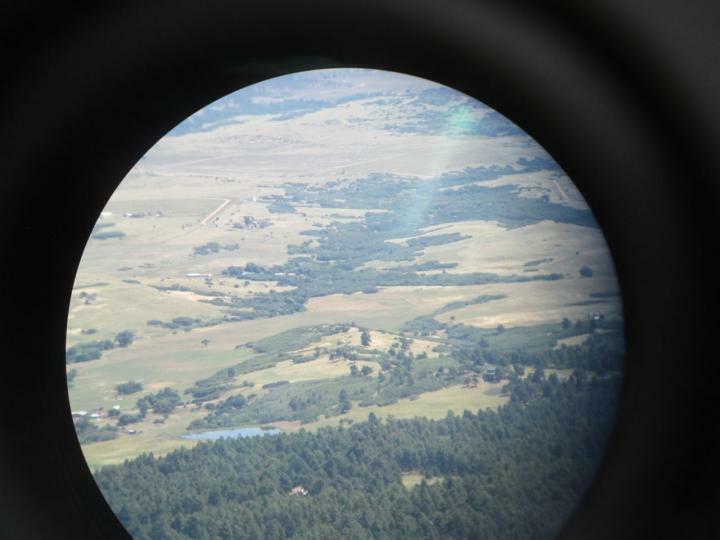 He took some photos through the lenses. I didn’t think they’d come out. I’m such a doubter! I forgot about this fun video we took last March. Phil and I took a nice walk around our property early Saturday evening before the sun dipped behind the mountains. The light was soft and pleasant, and some recent rainstorms had cheered the pastures to a gentle green. Tigerlily, clean and bright in the green grass. I love her fluffy tail. She gets it from her papa. Speak of the devil–Finn: spectacular as always. Sputnik often likes to walk with me now and I can even rest my hand on his back as we go along. 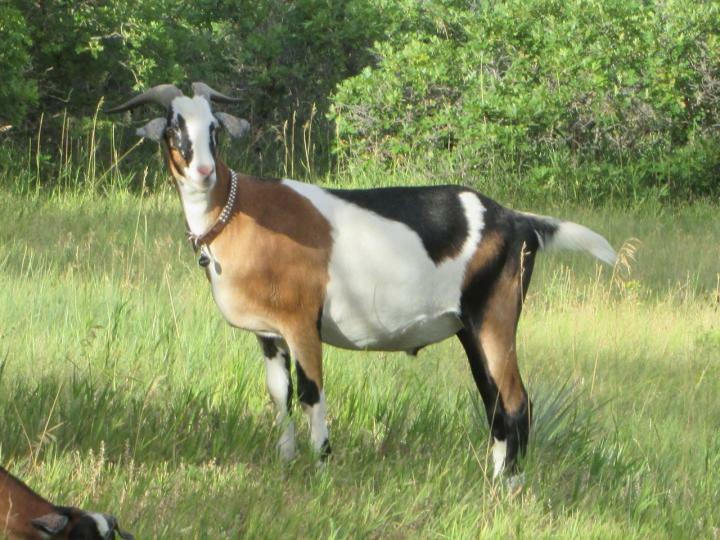 Our babies are growing like crazy and fast turning into big goats. 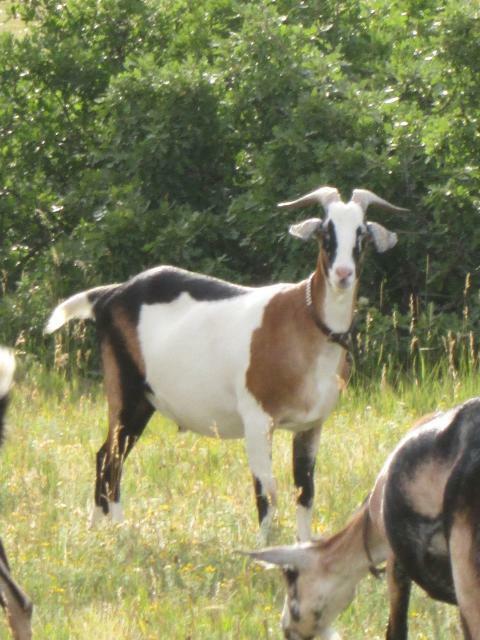 Rambo is looking particularly regal these days. And true to his name, he’s one giant ball of muscle. I had to restrain him for a minute this morning and I couldn’t believe how strong he was. He almost pulled me over and didn’t act like it took any effort at all. Oakley had an oak leaf stuck in her collar. It seemed fitting somehow. She’s a pampered little princess now that her brothers are gone. She gets all her mother’s attention and milk to herself. Pepi is adorable. She has this silly habit of running up from behind, planting both front feet on my bottom,and then walking along like that. She wants to start a conga line! 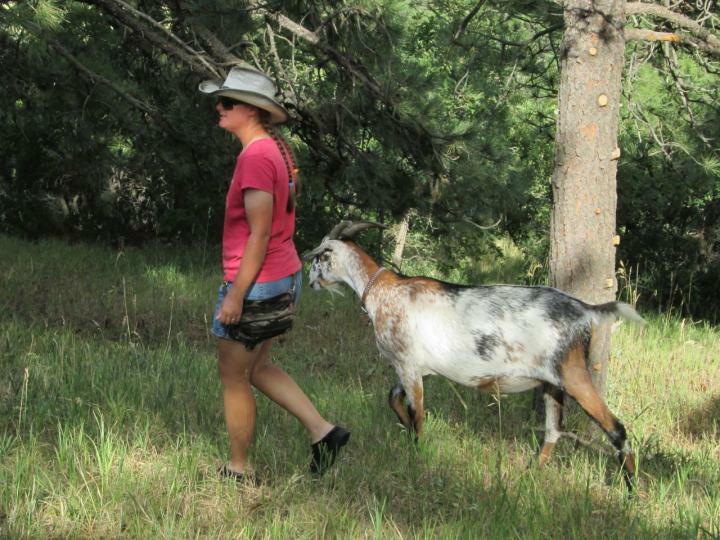 Six weeks ago she walked with her hind legs on my back for the entire length of a pasture! She hasn’t done it in a while but recently she started again. I need to discourage her because she’s getting too big for these shenanigans, but it’s hard to say no when they’re this cute and when they don’t mean anything remotely aggressive by it. She loves to waltz as well as conga! The poor fella has lost a lot of flesh in his old age, but I still admire his powerful shoulders and the length of his stride once he gets going. It takes him longer to get going these days and he certainly expends no extra energy, but he still loves a nice walk. King Cuzco. Need I say more? 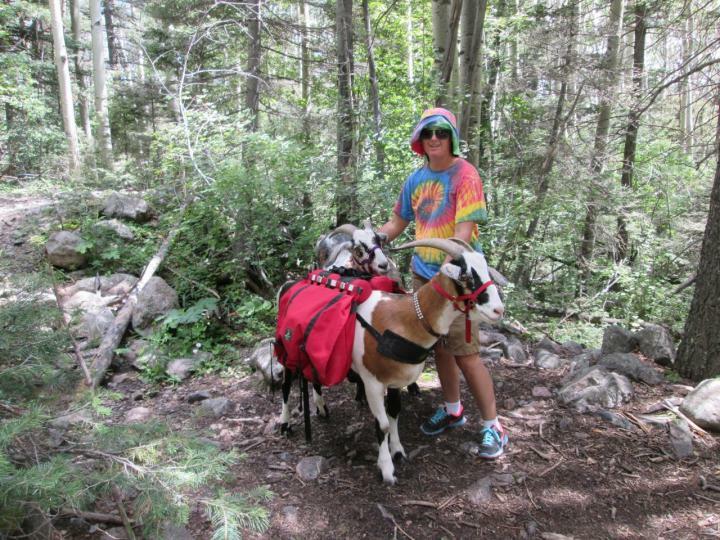 Last week Phil and I went for an evening walk after we’d already put the goats to bed. 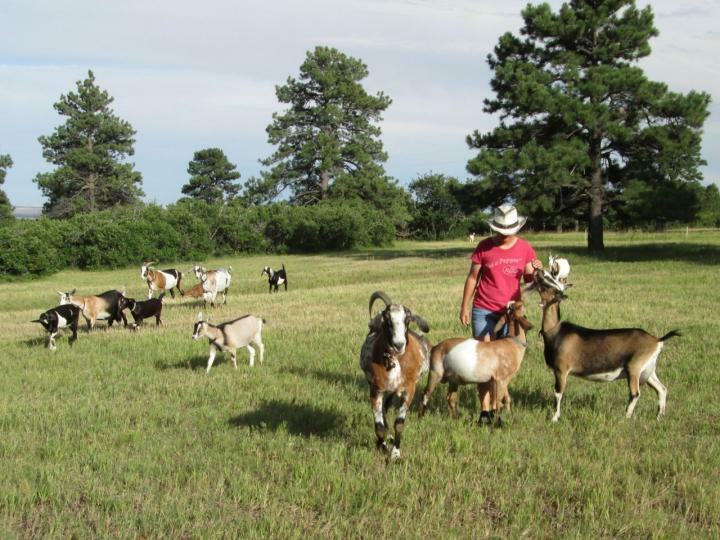 We decided it was too much to take the whole herd, and no one wanted to come with us except Cuzco and Finn anyway. So we brought those two out and started down the driveway. About halfway down, Cuzco whipped round without warning and broadsided Finn. 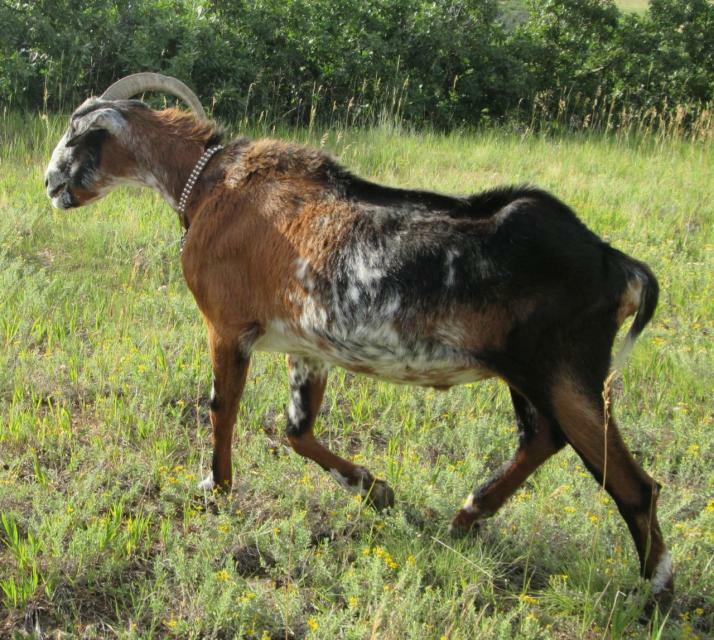 He spun Finn around 180 degrees then shoved him toward the goat pen. And that was the end of Finn’s walk. 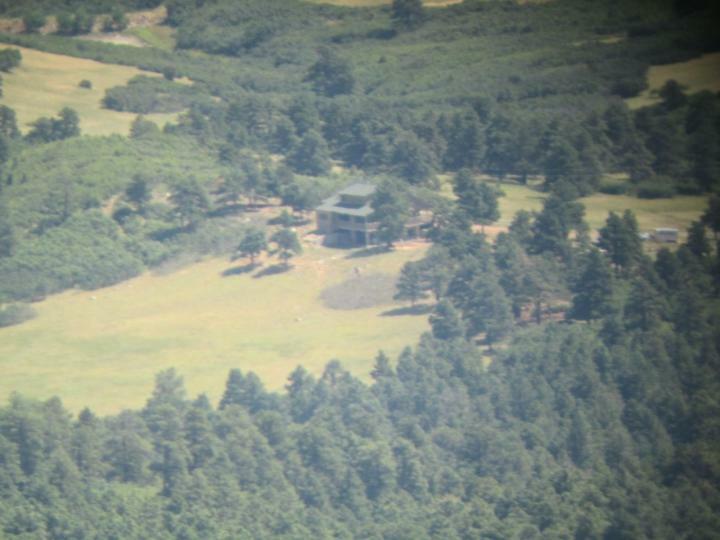 We tried calling him to follow us but he would come no further. 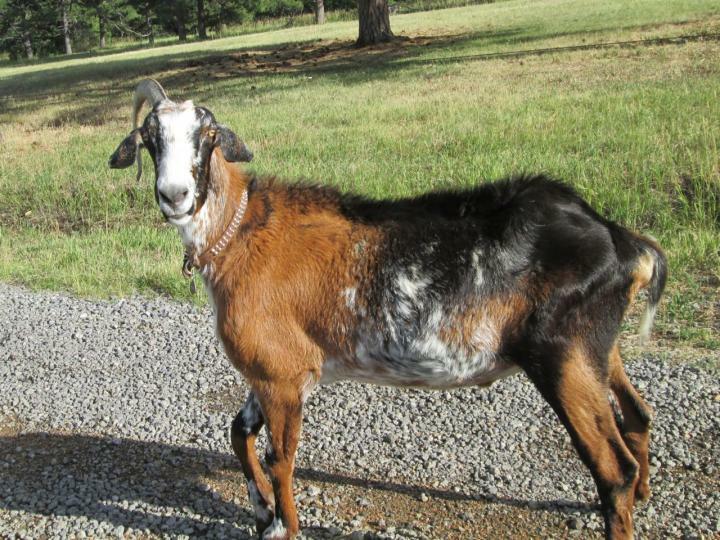 Finn stood in the driveway baa-aa-ing despondently until we were out of sight. 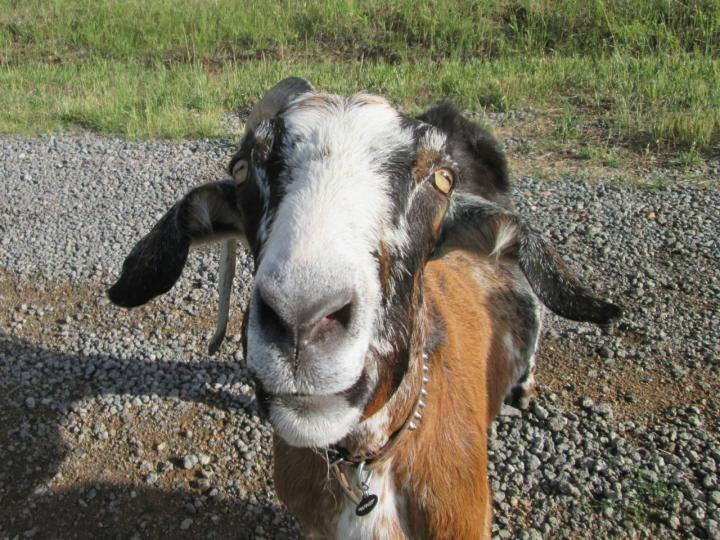 Cuzco, on the other hand, could not have been more smug. He strutted for the rest of the walk, pleased to have Phil and I all to himself for once. 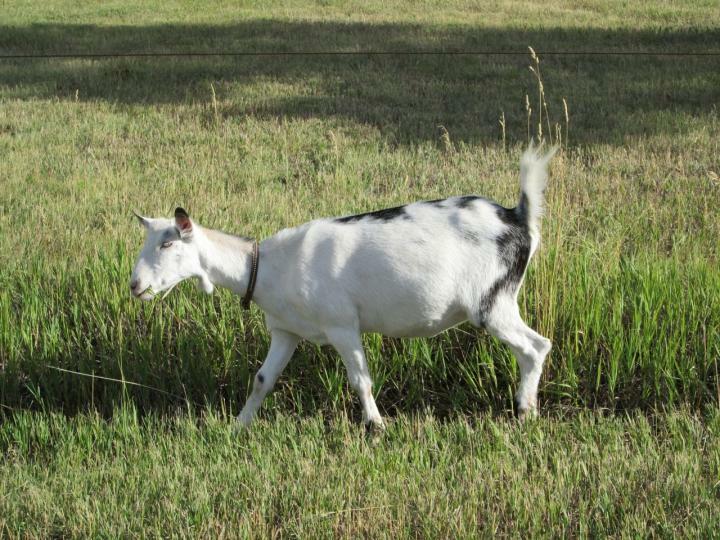 Finn made his lonely way back to the goat pen where he waited sadly by the gate until we returned. We gave him some cookies as a consolation prize. 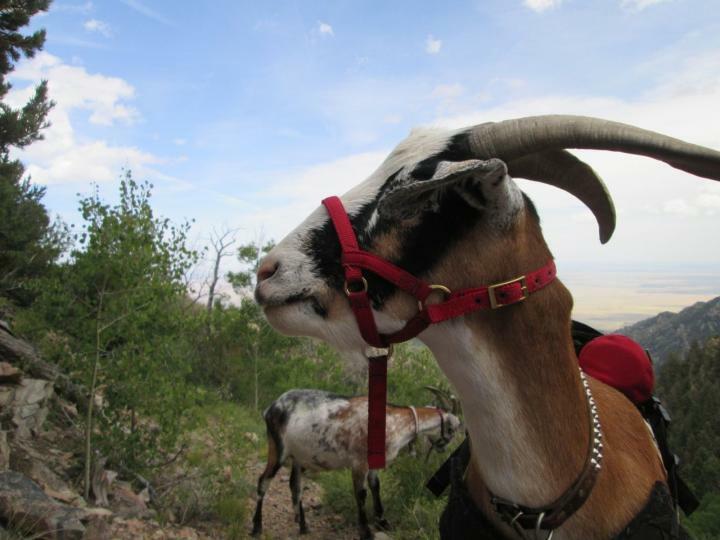 Normally I would not let one goat bully another out of a walk, but I sometimes feel that Cuzco needs these jubilant little triumphs lest he stop feeling relevant. 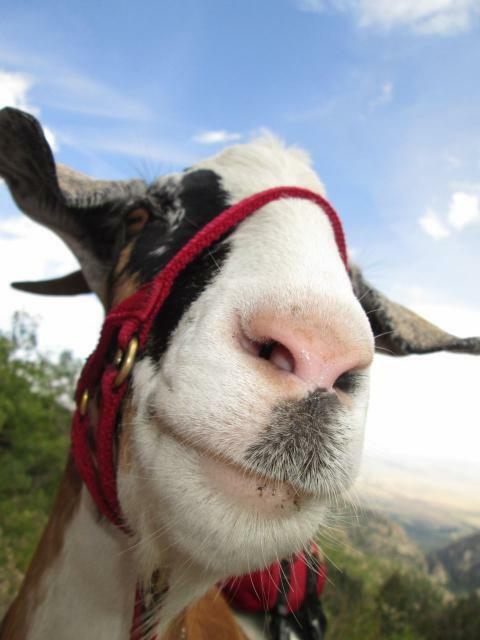 And I know he misses the one-on-one time he took for granted during those years as an only goat. He spends much of his time growling at Phil and I with his hackles raised for one thing or another these days, but when he gets us to himself he’s as sweet and loving as can be. I try to get him up on the porch from time to time so he can be alone with us, but he’s had difficulty managing the stairs this summer. He needs one of those stairlift chairs. But despite being increasingly cranky and arthritic, he’s never late for his grub! 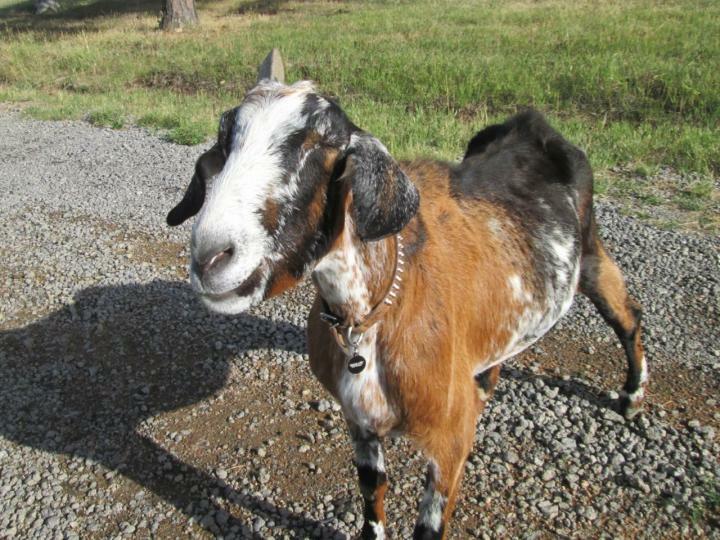 I recently got ahold of a huge jar of pecan brittle and woe to any goat but Cuzco who tries to touch it! A lack of teeth does not deter him from devouring it in enormous, crunchy mouthfuls. And with no teeth, I don’t have to worry about giving him cavities. 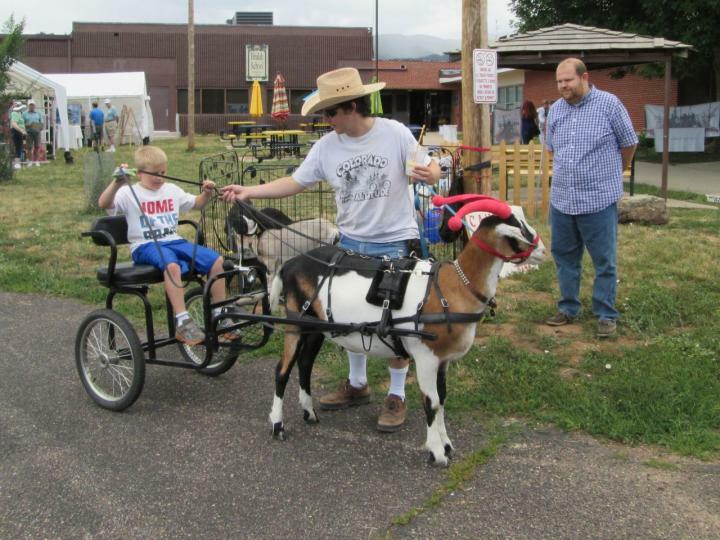 Our goats were invited to the Beulah Arts and Crafts Fair this year, so Phil and I packed up Finn and Sputnik, the cart, and a few of the younger goats for a petting zoo and headed on over. The boys had their horns wrapped for safety even though neither of them has ever shown the slightest inclination to hit anybody. Those horn tips are right at face level for most of these kids and all it would take is for a goat to turn his head to look at something and a kid could get whacked by mistake. So even though it looks kind of silly, we wrap the horns. Phil also pointed out that wrapping helps with visibility. 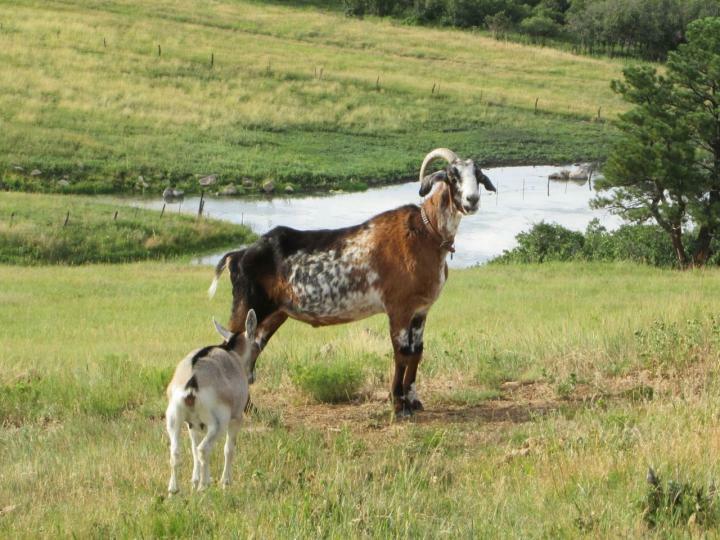 People notice the colorful horns that would otherwise blend into the background. Finn got cart duty first and he did a very nice job. 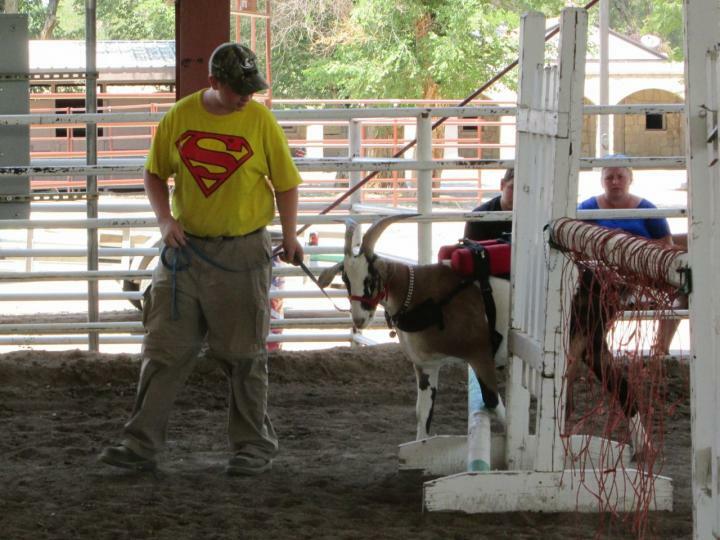 Here Phil shows a boy how to hold the reins, which are harmlessly hooked to the neck strap instead of the halter. The kids don’t know the difference and they think they’re getting to steer and stop. And they’re off! Reins properly held in each hand. After Finn got tired, Sputnik took over. These girls loved honking the horn. 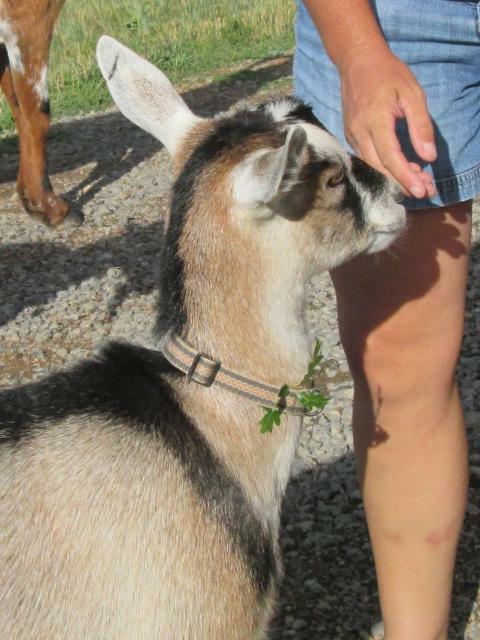 It was a fun day and the goats put smiles on a lot of people’s faces. Finn and Sputnik were tired by the end. Each of them pulled kids around for probably about an hour. I don’t think they were physically tired, but they were mentally drained from walking up and down the same road again and again. This was their first big event and we had to be careful not to overdo it. We retired them to the trailer as soon as they told us they’d had enough. 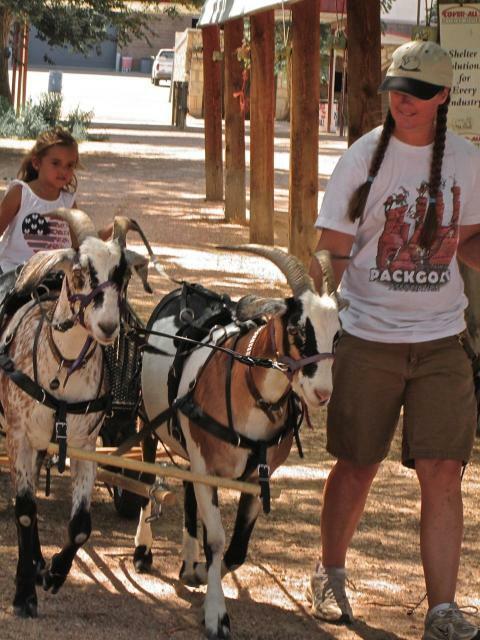 A few kids were disappointed that we packed up the cart before they had a chance to ride, but we directed them to the baby goat pen because baby goats never fail to turn a frown upside-down. It was a fun event! Phil and I were busy, busy, busy last week, and Thursday was no exception! 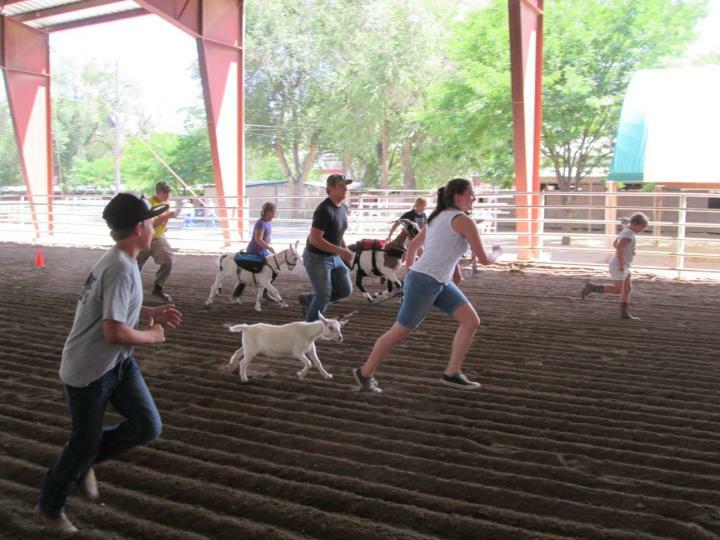 Thursday was the day of the annual Pueblo County Fair working goat competition/clinic. 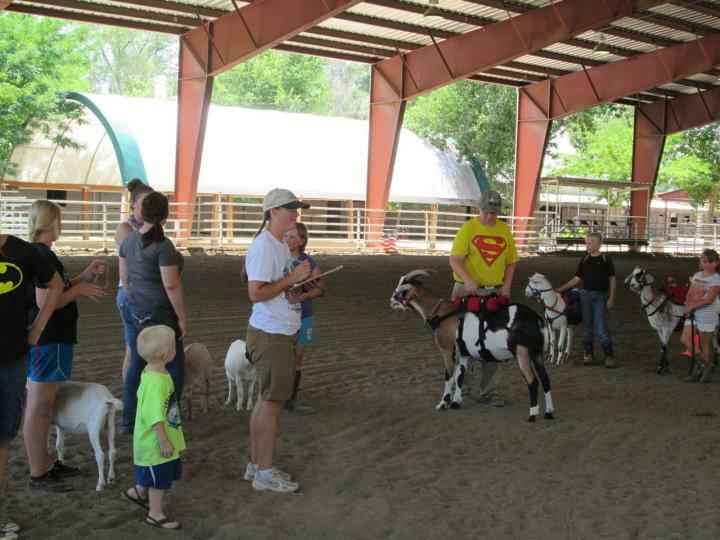 Phil and I first competed in this class with Cuzco back in 2008 and were disappointed to find that our only competitors were 4-H kids with their young dairy and market goats even though the class is open to the public. Since then we have withdrawn from competition but have somehow moved into a position of being in charge of the event. 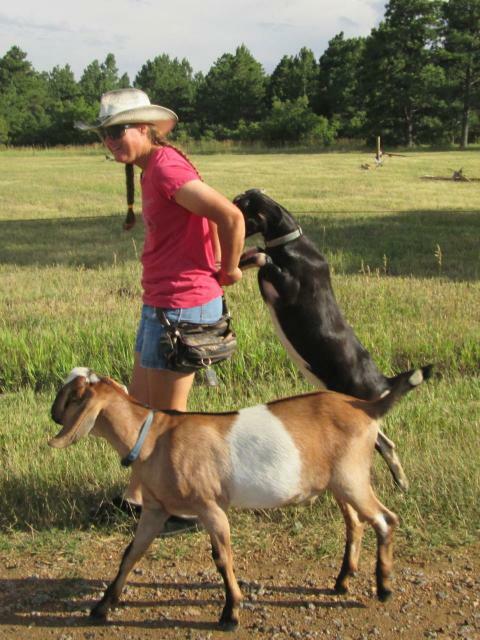 Since there are no kids with trained working goats we have moved away from strict competition into more of an open play event where kids can borrow our goats and try the obstacles with animals that somewhat know what they’re doing. 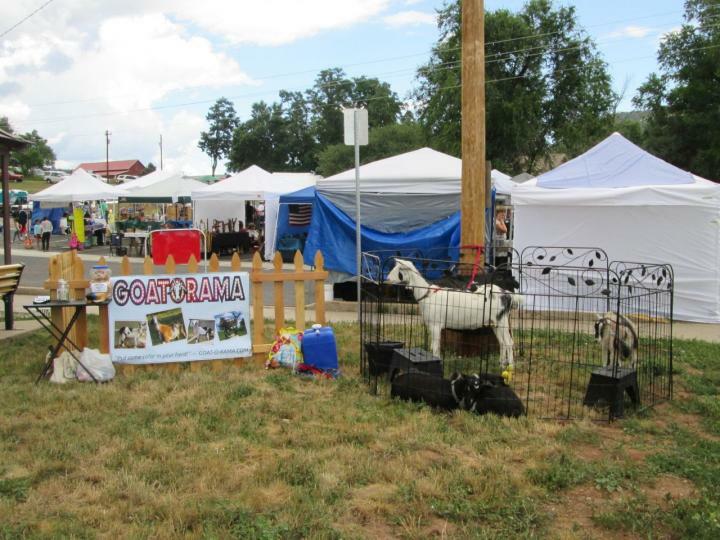 We brought Finn, Sputnik, and Tigerlily this year and several other kids brought their young dairy and market goats as well. I was particularly impressed with this young lady who took her little brother through the obstacle course with their Boer kid. 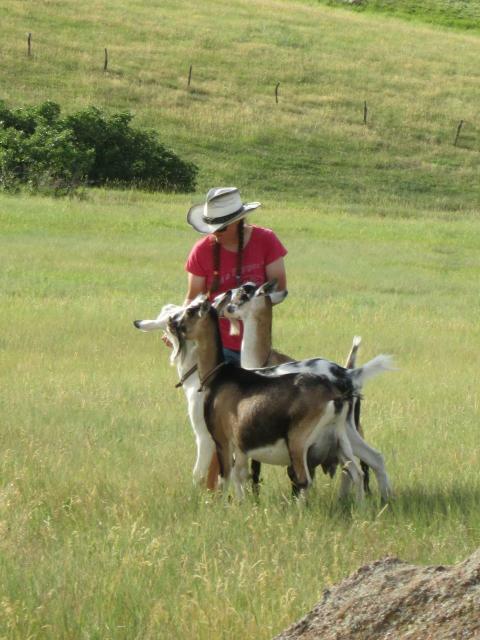 She (and all her siblings for that matter) were very gentle with the goats and helped guide them through rather than dragging them like most kids tend to do. 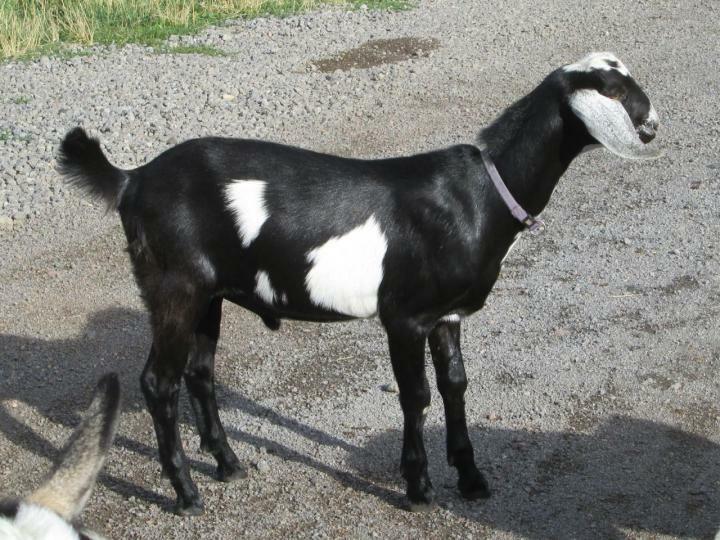 This little goat is being raised with his brother as a working wether prospect. 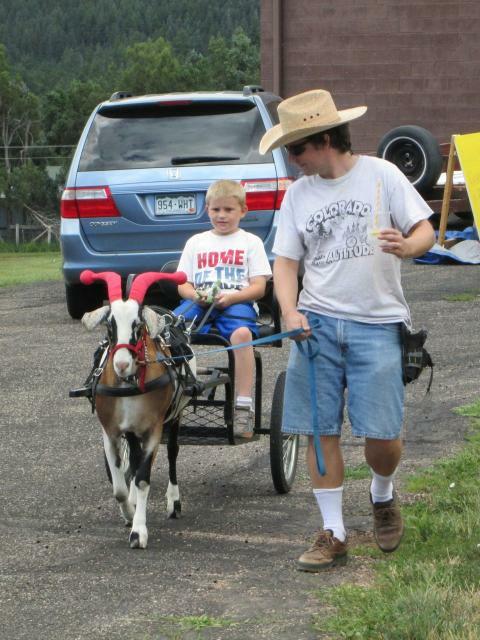 The father hopes to teach them to pull a cart as a team in a couple of years. 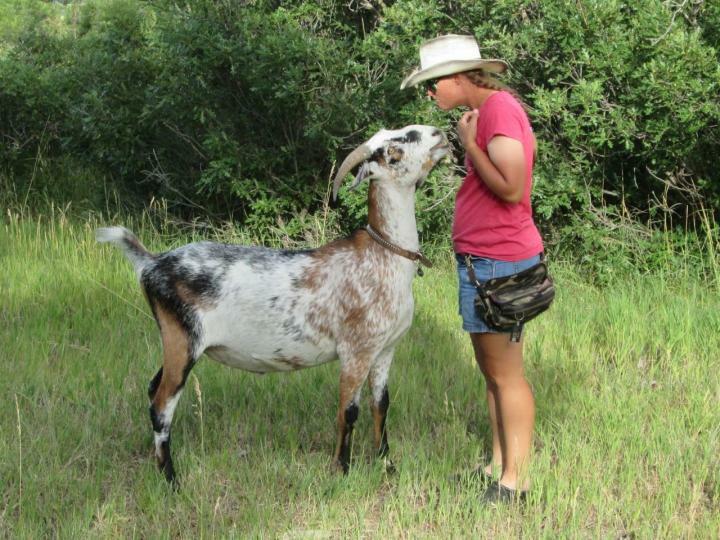 I’d say this little goat is off to a great start! The oldest son in that family was also gentle and understanding–to a fault. He took an immediate shine to Finn, but Finn unfortunately spotted an amateur and immediately took advantage of the situation. 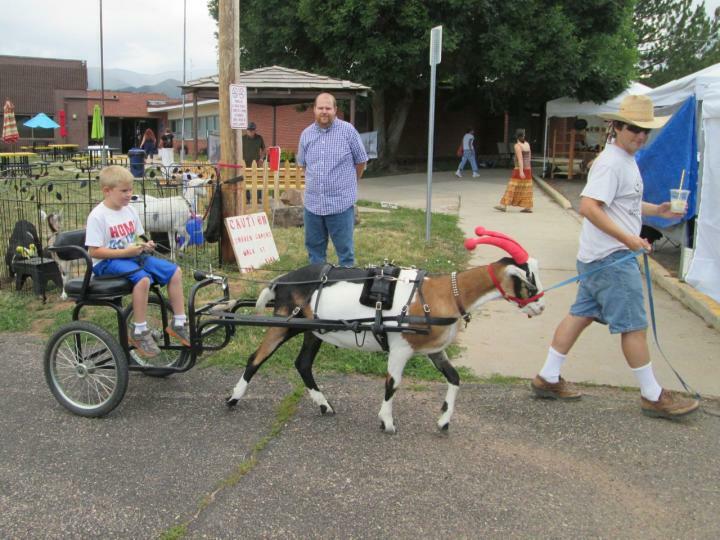 Finn, who is usually an overachiever and loves to show off at events like this, instead adopted a tired, ignorant, and almost disabled attitude on the course as his overly kind young handler plied him with ever-more cookies to try to entice him over the simplest of obstacles. Finn got to where he wouldn’t look at an obstacle without treats given before, during, and after every effort. It was a classic example of an animal training a human. Finn, who is usually a magnificent jumper, stared mournfully at the ground-level end of this pole as though it were ten feet high and covered with spikes. His patient handler wheedled and coaxed until Finn eventually sighed like a martyr and dragged his feet over one at a time with heroic effort. Sputnik, on the other hand, could not have been more cooperative. 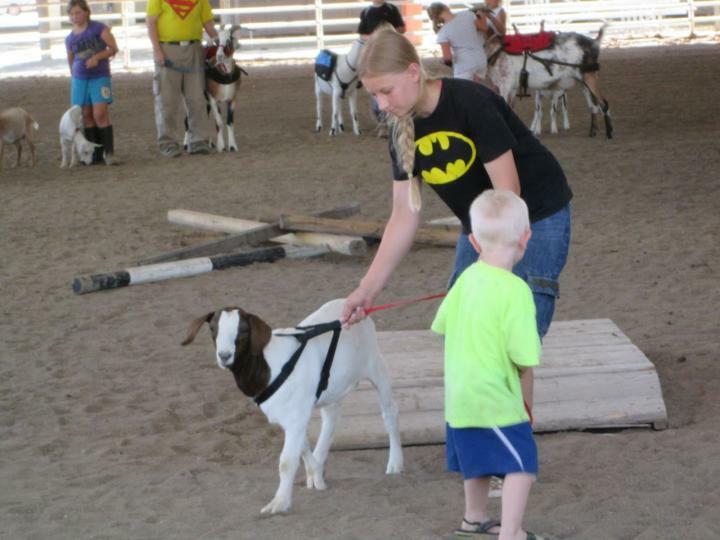 He behaved perfectly for every kid that handled him (and there were quite a few after it became obvious that he was the best at navigating the course). We ended up having a little judged competition and this boy won with Sputnik. The only thing that was sometimes troublesome for Sputnik was the ground tying obstacle. 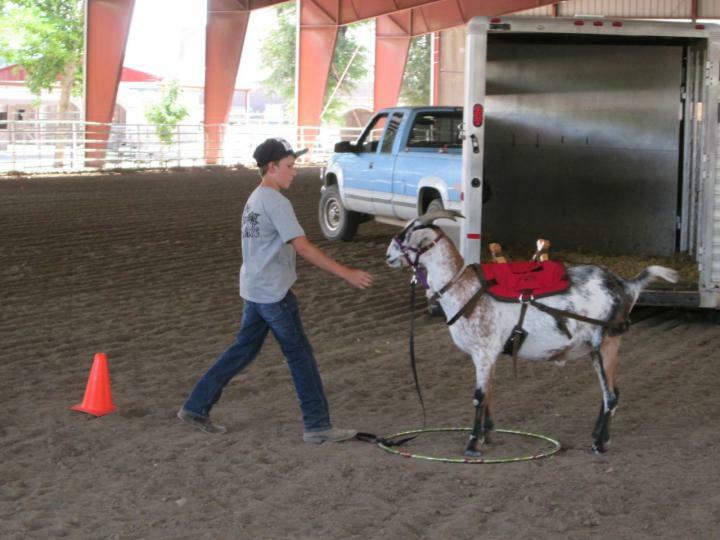 The kids had to park their goat’s front feet inside the hula hoop then drop the rope and walk around the cone. Sputnik stood very nicely, but some of the kids were afraid he would leave so they bolted frantically back toward his head to grab him before he could run off. This had the predictable result of making him run off. I was pleased to see that he never ran far or fast so the kids were always able to catch him without help within a few strides. 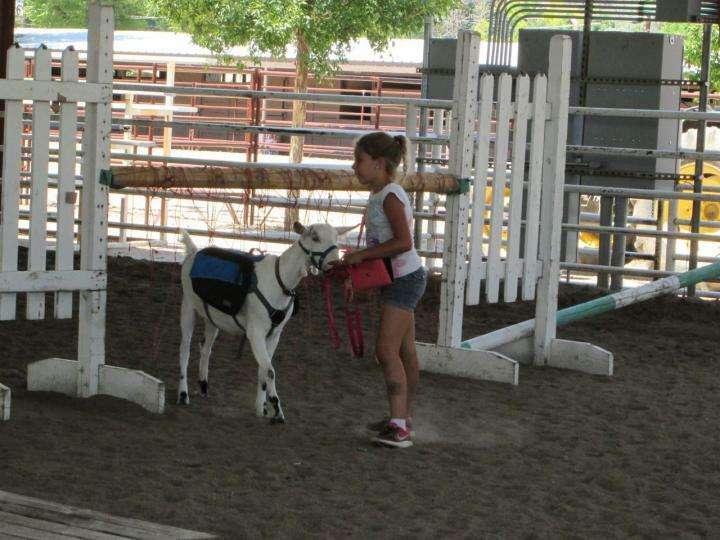 This poor girl had a little Alpine doeling who was not trained to lead, let alone walk through an obstacle course. The goat kept sitting or laying down every dozen yards or so. The worst was when the poor, pathetic creature collapsed completely on her side and just laid there like a dead animal until someone picked her up. 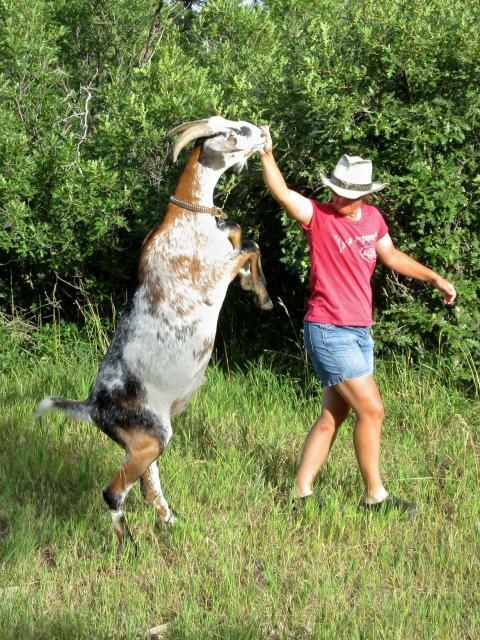 The girl was very patient with her and never pulled hard on her neck or anything, but the goat was determined not to walk and I felt sorry for the young handler. This is the same talented little girl who did so well getting a reluctant Pac-Man to negotiate the obstacle course at this same event two years ago and who worked with him again last year. 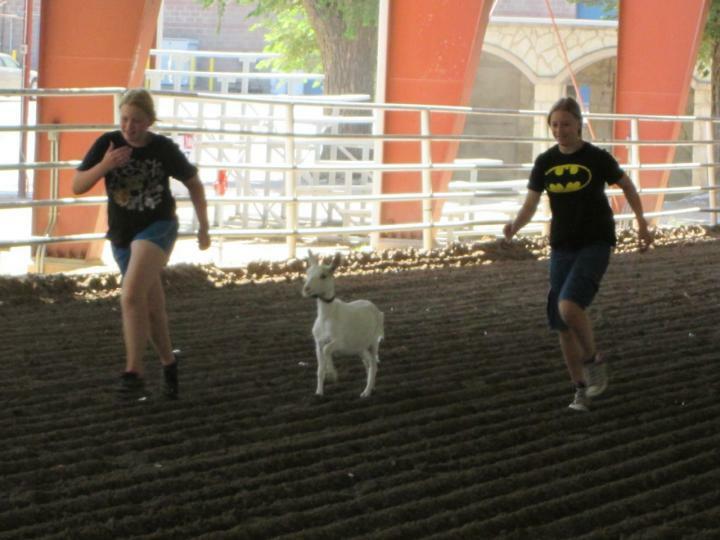 She missed Pac-Man and I know she was unhappy with her own goat’s attitude. 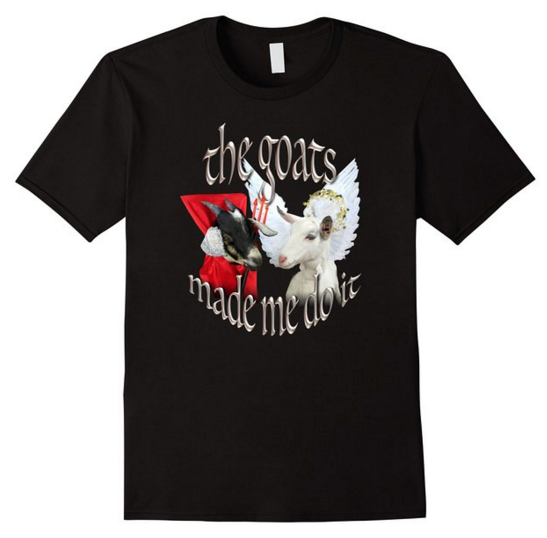 So I had her put her goat away and work with mine. She led Tigerlily through very nicely and even won 5th place on the course with Sputnik. But if she’d had Pac-Man she probably would have won. Those two had a very special “love at first sight” bond. 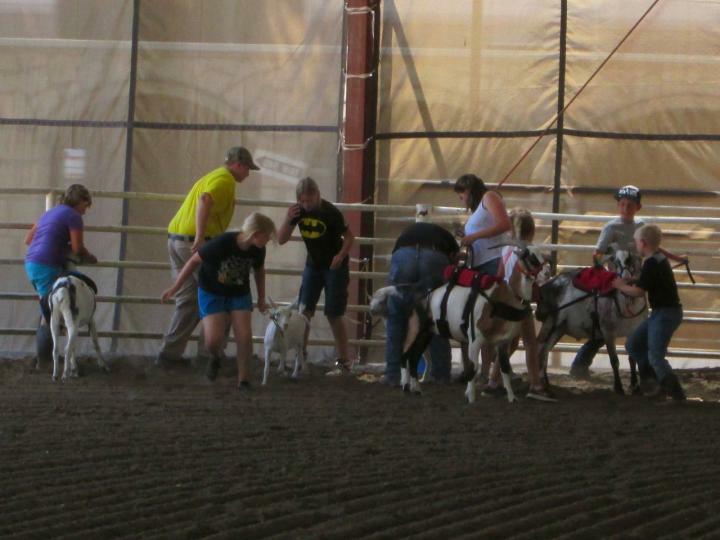 After the obstacle competition, Phil took the kids and goats to the other end of the arena to do a ribbon race while I tallied the scores. It was hilarious! 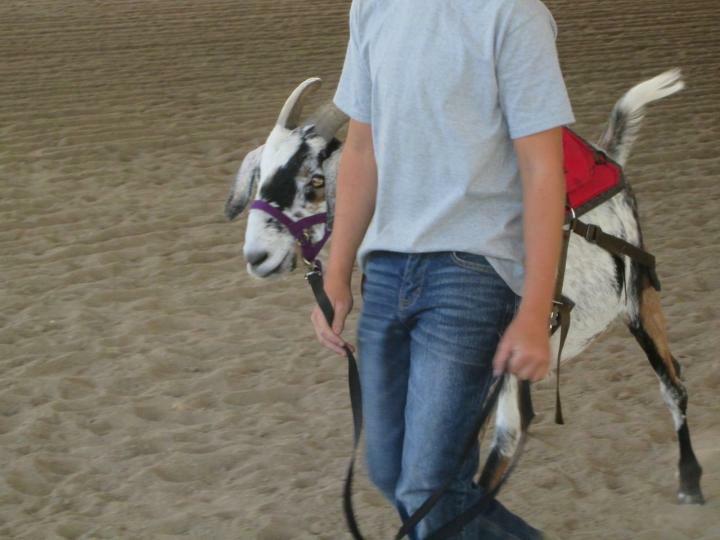 The kids paired up and had one goat between them. They lined up at one end of the arena and there was a bucket full of ribbons at the other end. 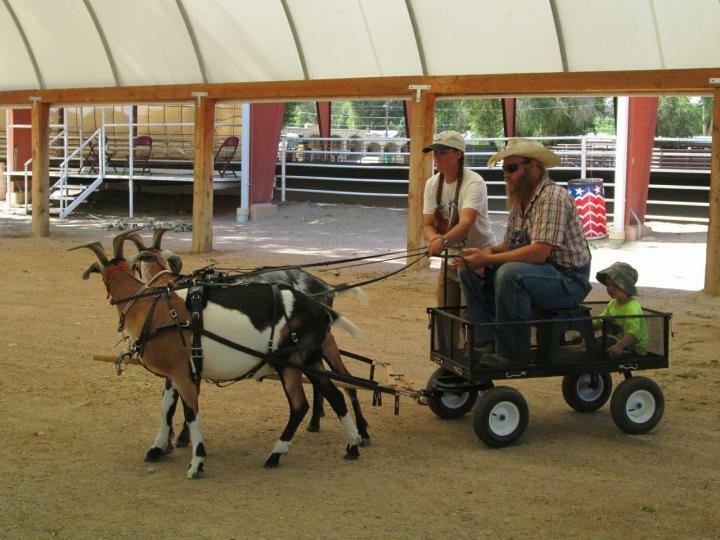 They had to race down to the bucket with their goat and one kid held the goat steady while the other tied a ribbon to its tail. Once the ribbon was secured they had to race back. I did not have a good view of the race from my seat because the truck and trailer that comprised the final obstacle blocked much of the scene. However, I could see the start and finish lines, so I got a brief but hysterically funny glimpse of Sputnik as he tore off at top speed with a kid sailing horizontally behind him in classic Superman-style. The kid was making a downward arc toward the dirt when they disappeared behind the trailer. Sputnik appeared almost instantly on the other side of the vehicle dragging a leash with no kid on it. Soon afterwards both his kids came out from behind the trailer, one of them dusting his pants as he ran. Sputnik waited for them near the bucket where they caught up to him, got the ribbon on his tail, then turned to run back. 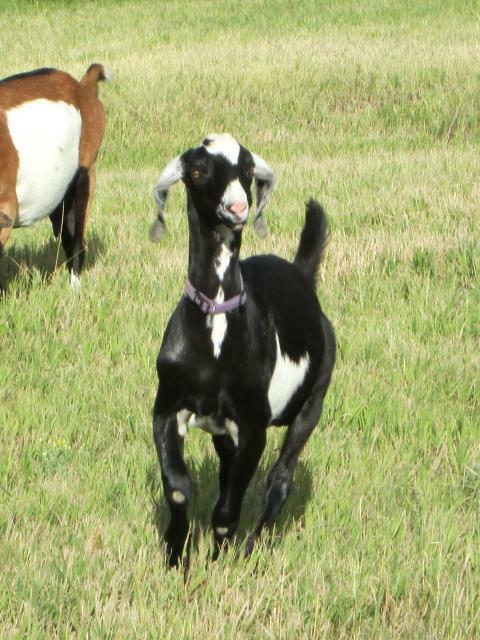 But as soon as it was time to run, Sputnik took off full blast and once more left his companions trailing behind. He crossed the finish line alone and was disqualified. But I think he may have had the most fun of anybody. Here are the kids, tying ribbons to tails before dashing back. And here are the winners of the ribbon race! Finn and his kids were in second place but the ribbon fell off Finn’s tail less than ten feet from the finish line and they were disqualified. 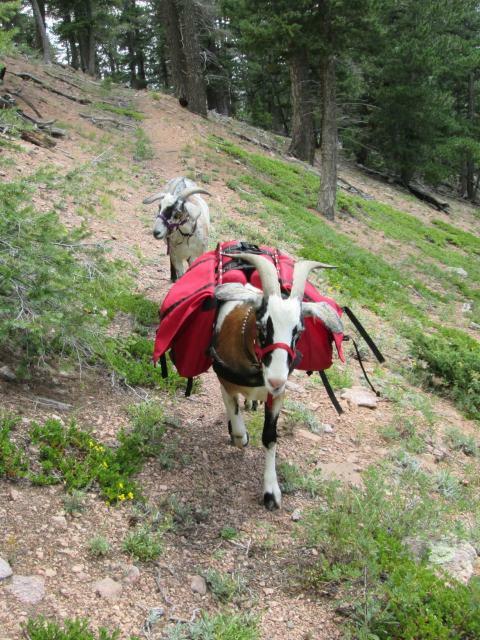 So much for my “speedy” packgoat boys! They were beat by a girl, and a baby one at that! 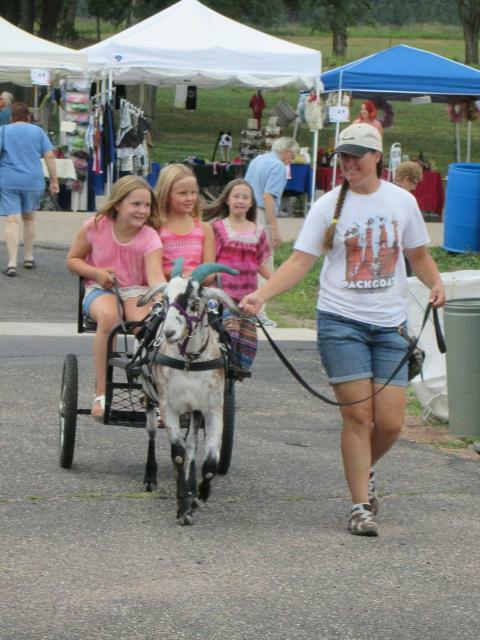 After the ribbon race and the obstacle course prize-giving, we broke out the wagon and harnesses and gave a little harnessing and hitching lesson to those who were interested. Most of the kids were not, but their parents were fascinated and asked lots of questions. We took the team out of the arena, which was much too deep and dusty for driving, and out into a quiet shaded area nearby. 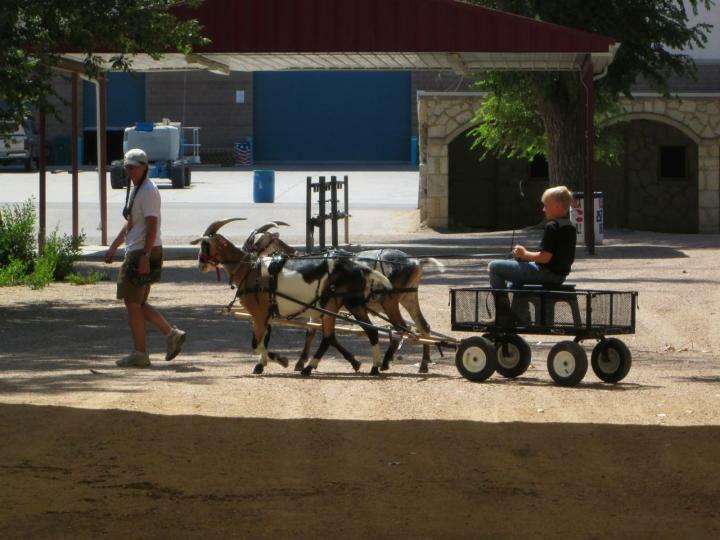 Here I let the kids take turns driving the goats while I walked alongside. 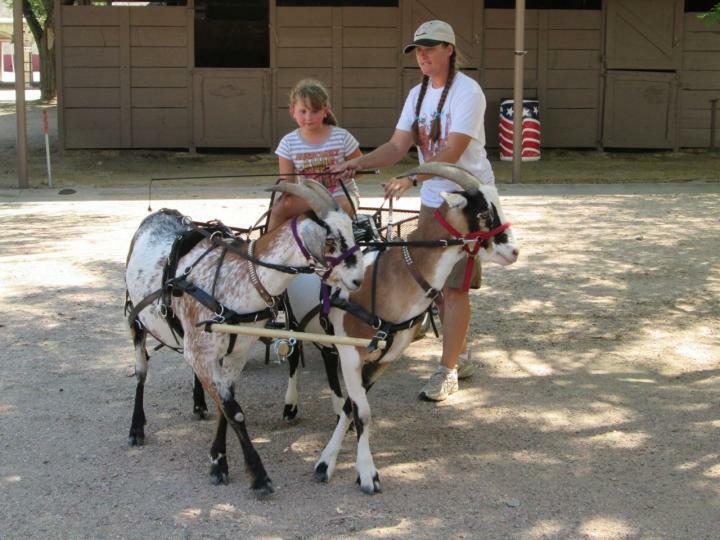 We used halters instead of bridles for this activity of course, and the goats were very willing and patient with their young drivers. 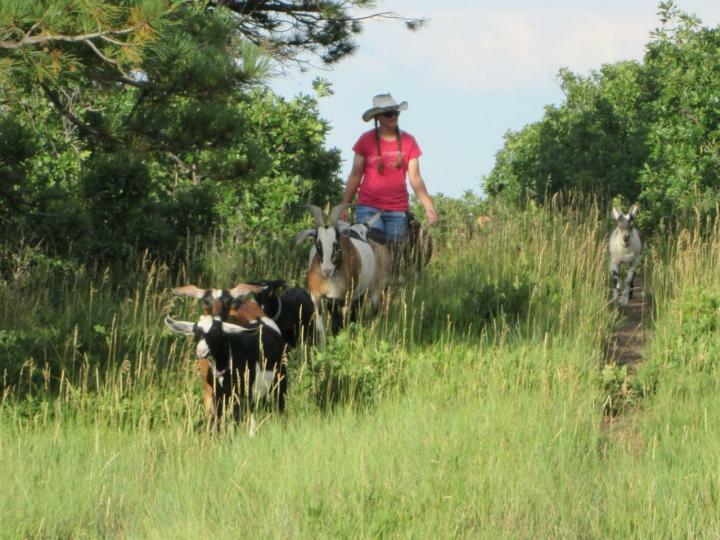 We made a pretty tight turn here so I helped the young driver by taking the reins ahead of her hands and guiding the goats’ heads while cueing Sputnik’s outside hip with the whip. 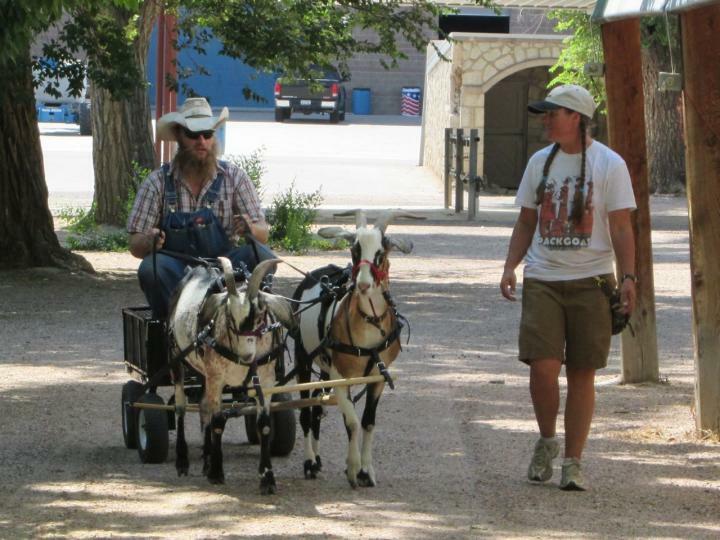 The boys are really starting to learn how to turn the wagon properly by crossing their front legs over instead of trying to bend their bodies on a curve. 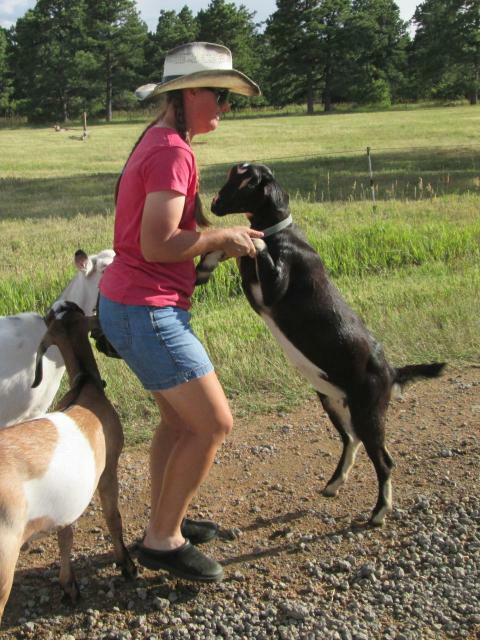 The last person to drive was Nick, the father of five wonderful kids whose gentleness and patience with the goats impressed me. 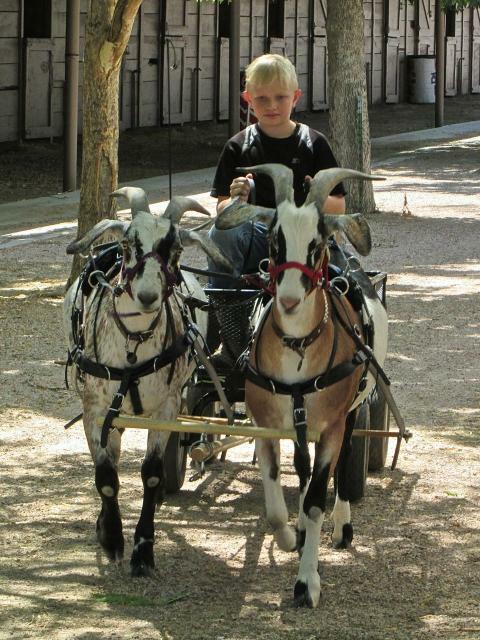 The boy Tommy was thrilled to ride behind his dad and hold the long ends of the reins (talk about a backseat driver!) 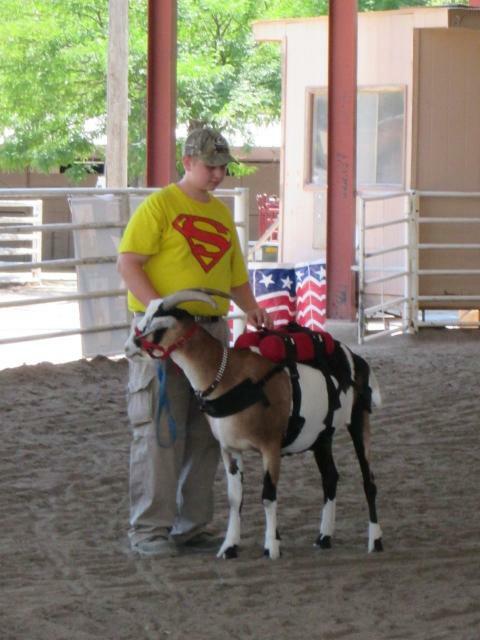 Nick wants to train a goat team to drive but has never driven any animal before. 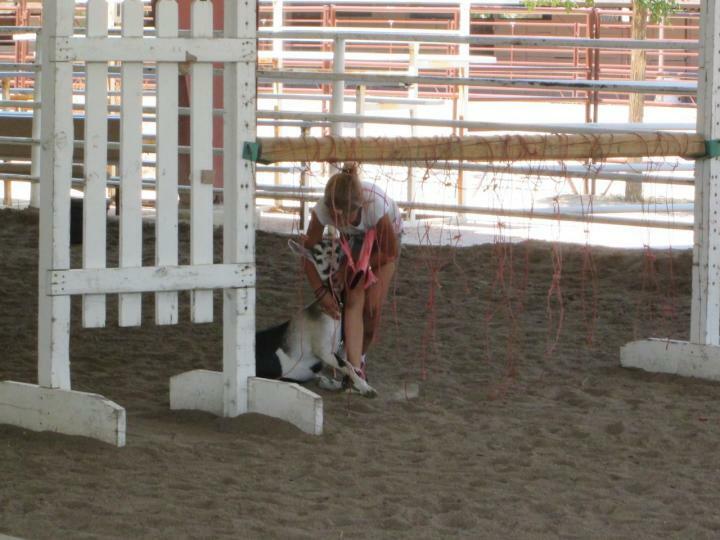 I spent some time showing him how to handle the reins and whip properly. He was a very good learner but of course needs practice. Driving a team is much like playing an instrument. It takes a lot of finesse and coordination to do it well, and these things can only come from spending time at the reins.